In a minor league deal with the St. Louis Blues, the Nashville Predators re-acquired defenseman Scott Ford in exchange for forward Jani Lajunen. Ford will report to the Milwaukee Admirals where he served as team captain last season. He played in 279 games with the Ads over the last four seasons and was always a fan favorite. The 33 year-old, 6'3", 218 pound D-man has been a career minor leaguer but has participated in Predator pre-season camps due to his leadership and mentoring ability with young prospects. Several other moves were announced by Milwaukee including forward Patrick Cehlin and defenseman Taylor Aronson being reassigned to the Cincinnati Cyclones of the ECHL. Also, goaltender Zoltan Hetenyi has been loaned to the Orlando Solar Bears of the ECHL. The Nashville Predators announced on Friday morning that enforcer Brian McGrattan has been assigned to the Milwaukee Admirals for a two week conditioning assignment. He will remain on the Preds' roster but receive an opportunity to play with the Ads and become more game-ready. The 6'4" 235 pound winger from Hamilton, Ontario has only played in two contests in Nashville this year, totaling 12:34 in ice time and had not suited up since January 21. In his limited time, he did not make the score sheet in points or PIMs. Much of his tough-guy role with the Preds appears to have been taken by diminutive irritant, Rich Clune, who has played 13 games and scored his first NHL goal on February fifth in St. Louis. He is currently tied for second in the NHL in fighting majors with five. It is unclear if this move is truly a "conditioning" assignment or if McGrattan's abilities are being showcased to other teams who may be looking for additional toughness which appears to be becoming more of a factor in this short intense season. The Nashville Predators have always been known for stingy defense and world class goaltending but have yet to claim the one piece of hardware that goes to the goalies of the team that gives up the fewest goals over the course of an NHL season. According to NHL.com, "The William M. Jennings Trophy is an annual award given to the goalkeeper(s) having played a minimum of 25 games for the team with the fewest goals scored against it. Winners are selected based on regular-season play." "The Jennings Trophy was presented in 1981-82 by the National Hockey League's Board of Governors to honor the late William M. Jennings, longtime governor and president of the New York Rangers and one of the great builders of hockey in the United States." After Thursday's 3-0 shutout of the Phoenix Coyotes by Pekka Rinne, the Predators cut their league leading goals against average to 1.64 goals per game. Nashville has only allowed 23 goals in their 14 contests in route to a 7-3-4 record which is tied for the fourth highest number of points in the league at 18. The Predators continue their homestand at Bridgestone Arena Saturday night against the Anaheim Ducks. 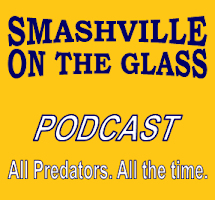 Puck drop will be at 7 p.m.
As you probably do not know, the reason for my lack of posting and in person presence around the Predators' rink this year is that I will be undergoing a full hip replacement this coming Thursday which will require a six week period of no driving or public appearances. Therefore, I am limited to comments from the couch for the time being. In spite of my infirmary, I was able to give a standing "O" when the Preds went up 5-0 against division rival, St. Louis, in the two teams third meeting in this young season. After averaging 1.5 goals per game, it was truly a miracle for the Preds to break out with five goals in 30:09 minutes of play. With the odd scheduling where they actually returned home during the road trip, I was somewhat concerned that it could have been a distraction but Barry Trotz remains a master in the psychology of the game. Ryan Ellis picking up the first goal of the game when he fired the puck at the net on the power play and bounced it off a Blues player for the first goal of the game. Rich Clune picked up his first NHL goal when he was crashing the net and picked up the rebound off a Colin Wilson shot. His first intermission appearance was classic. Nick Spalling getting his second goal of the year with aggressive play to end the opening period. Any goal by Kevin Klein is a masterpiece. Klein is the most unappreciated defenseman in the NHL. Gabriel Bourque finishing up Wilson's shot on goal with his skate (without a kicking motion). Wilson having a huge three point game as he tries to solidify his position as a young force on the team. His post game TV appearance exuded confidence in front of the camera not previously seen. Mart Erat grabbing a goal in the waning minutes of the game to gain his scoring confidence. Pekka Rinne being on top of his game, stopping 31 of 32 Blues shots. The Preds' lack of discipline that led to three penalties and a Blues goal at the end of the second period. Preds going down 5 on 3 early in the third to raise Rinne's blood pressure. Chris Stewart in a scuffle with Paul Gaustad to end the game. It was really not surprising that the Preds were out hit 17-6 in a game that was frustrating for the Blues. The Predators giving up 32 shots while only getting 19 on goal (including only three in the second period) , despite the lopsided win. The Predators finally return home on Thursday night against the Kings which I hope to be able to watch in a post surgery anesthesia haze.